Fitted with impressive 250PS EcoBoost engine. Available as a hatchback or an estate. Great value for money compared to other hot hatches. 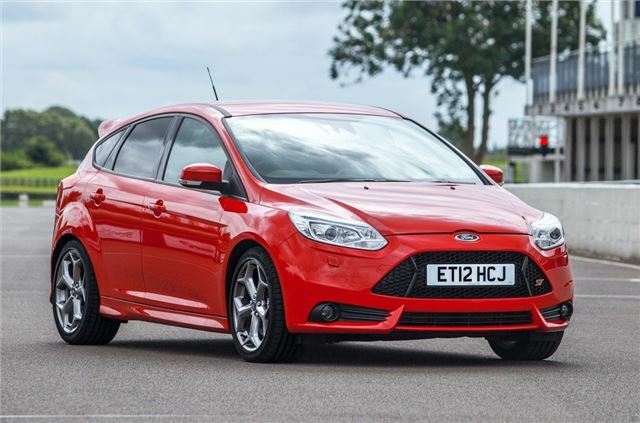 Despite 'symposer', engine may be too quiet for some hot hatch fans. Engine can develop a wiring problem. 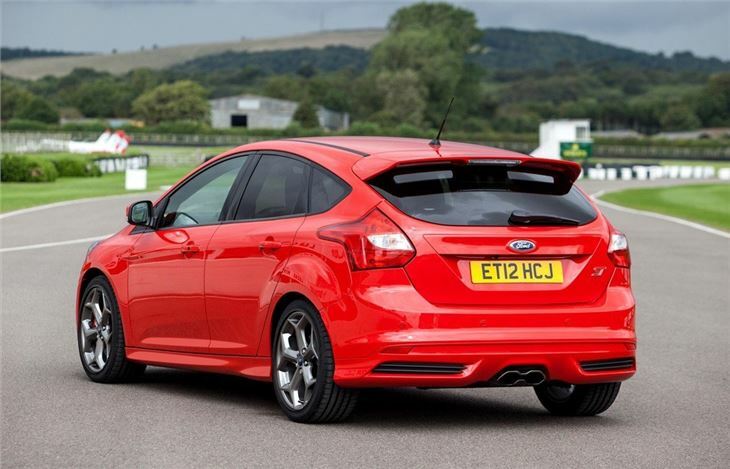 Ford’s ST brand has come a long way over the last 12 years, slowly transforming the humble Focus into a potent hot hatch that harks back to the fast Fords of the 1980s. 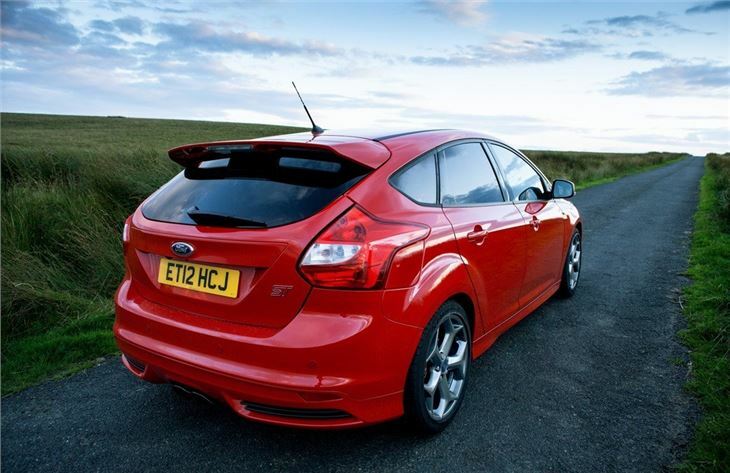 Now in its third generation, the Focus ST is faster, lighter and more economical than ever before. As you’d expect, the latest ST is very different from the standard Focus, with a lowered chassis (10mm) and a new front and rear end. Ford further enhanced the exterior with a light facelift in 2015, which enlarged the grille and slimmed down the front and rear lights. Muscular rocker panels and a large rear spoiler define the shape of the car, while a hexagonal mesh grille and LED lights complete the hot hatch appearance. Inside the changes are more subtle, with Recaro sports seats, leather gear knob and ST stitching. The interior was given a through refresh in 2015 and the button heavy dashboard was replaced with a clean, clutter free design. The steering wheel was also improved, with easier to use on-board buttons and improved finger grips. Under the bonnet the old Volvo derived 2.5-litre five-cylinder engine has been ditched in in favour of Ford’s 2.0-litre EcoBoost four-cylinder unit. Power is an impressive 250PS, which brings the 0-62mph down to a Golf GTI matching 6.5 seconds. 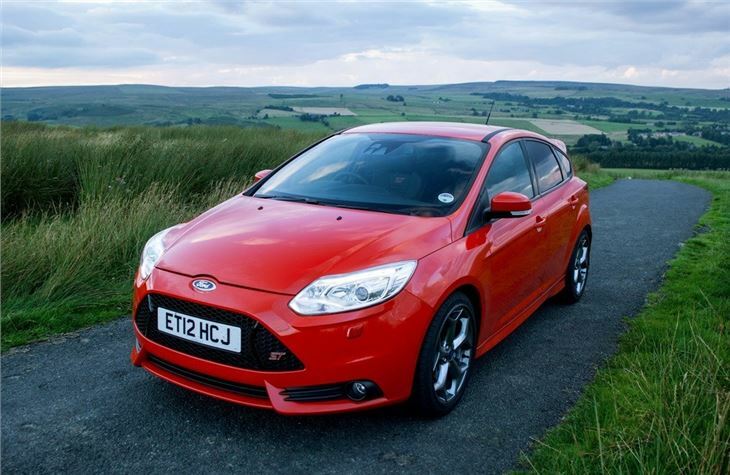 Ford has also improved fuel efficiency, with the new engine returning a claimed 39.2mpg and emitting 169g/km of CO2. 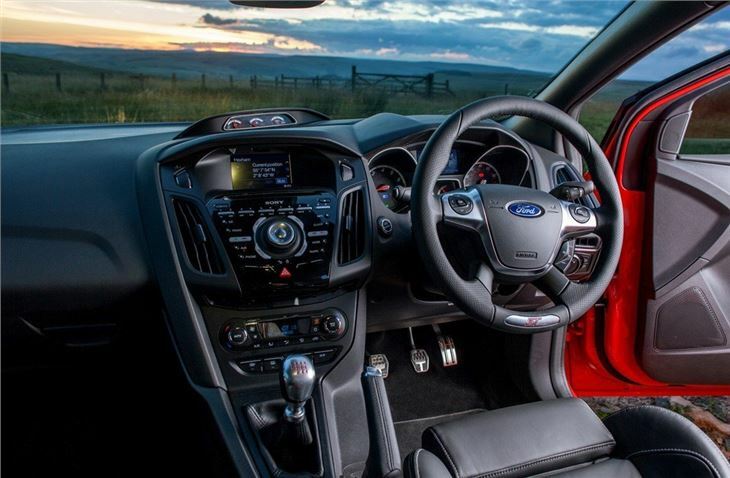 Ford’s in-house Team RS has also worked on the car, re-designing the air intake and exhaust systems and using a clever engine calibration to deliver a notable 360Nm of torque. From 2015, the Focus ST gets a diesel engine for the first time, with a turbochargd 2.0-litre engine producing 185PS and 400Nm of torque. Although lacking the punch of its EcoBoost counterpart, the diesel unit will return a claimed 67.3mpg, while emitting just 110g/km of CO2. Power is delivered to the front-wheels via a six-speed manual gearbox, which has been optimised with sporting ratios carefully matched to the performance characteristics of the engine. The demons of torque steer are (partly) contained with the use of an electronic compensator, which feeds back into the power steering to counter any disruption in the handling. Sports suspension and high performance brakes also come as standard. 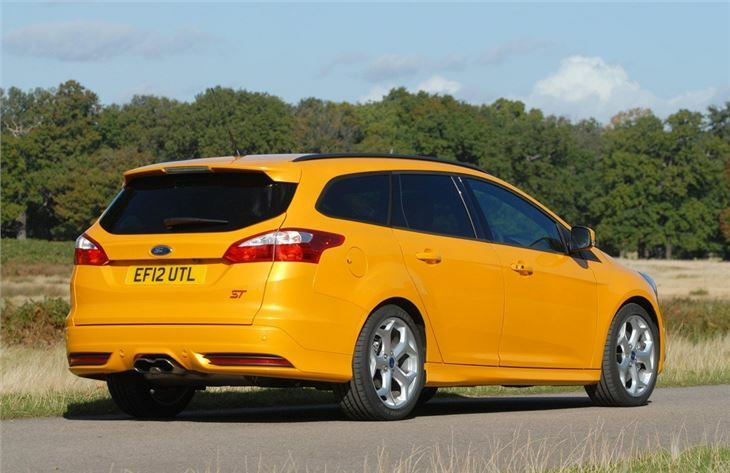 Available as a five-door hatch or estate, there are three trims to choose from – ST1, ST2 or ST3 – and the top spec models feature heated seats, xenon highlights and dual-zone air con. 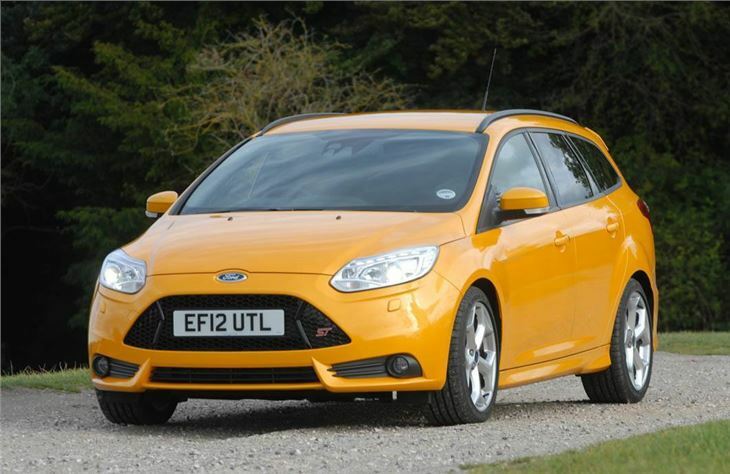 Ford also offers a range of unique paint schemes for the ST, which range from the traditional racing blue to the extravagant bright orange Tangerine Scream.